Workman Publishing Company, 9780761122753, 820pp. Now the beloved classic is revised front-to-back. The new edition has gone 100% organic, which in Barbara Damrosch's hands also means completely accessible. It reflects the latest research on plants, soils, tools, and techniques. 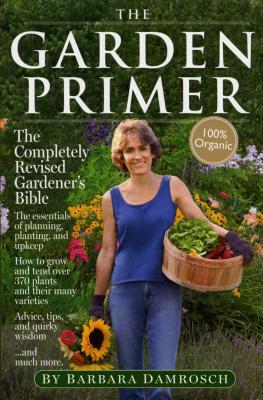 There is updated and expanded information on planning a garden, recommended plants, and best tools. Ecological issues are addressed much more extensively, covering lawn alternatives, the benefits of native species, wildlife-friendly gardens, and how to avoid harmful invasive species. More attention is paid to plants appropriate to the South, Southwest, and West Coast, while cold-climate gardeners are given detailed advice on how to extend the growing season. Simply put, the book is a richer and fuller compendium than ever before, with more text, more illustrations and garden plans, expanded plant lists, and gardener's resources. But Barbara Damrosch's core of practical, creative ideas and friendly style remain—she is still an "old-fashioned dirt gardener" at heart. Barbara Damrosch is one of the nation's most respected garden experts and writers. She is the author of Theme Gardens and The Garden Primer and writes a weekly column for The Washington Post called "A Cook’s Garden." She appeared as a regular correspondent on the PBS series The Victory Garden, and co-hosted the series Gardening Naturally for The Learning Channel. She is the co-owner, with her husband, Eliot Coleman, of Four Season Farm, an experimental market garden in Harborside, Maine, that is a nationally recognized model of small-scale sustainable agriculture.